Want to know how to deal a serious blow to your landing page conversions? Have the landing page look different from the online advertisement the consumer just viewed and have the landing page contain a different message/keywords. In other words, one of the best ways to improve landing page conversions is to create and maintain scent: make pre-click advertisements and post-click messages look and feel the same. There needs to be “scent”. The ad they see or the email they read needs to smell like the landing page they land on. You have to maintain the same scent. The concept of scent was first introduced by Bryan Eisenberg in Always Be Testing. 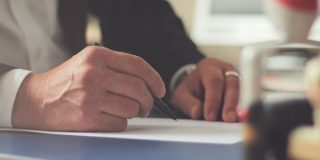 While so many landing page optimization efforts go toward better structure, copy, design, and/or call to action – it’s often the missing scent that’s the culprit. They match! It’s like they coordinated! 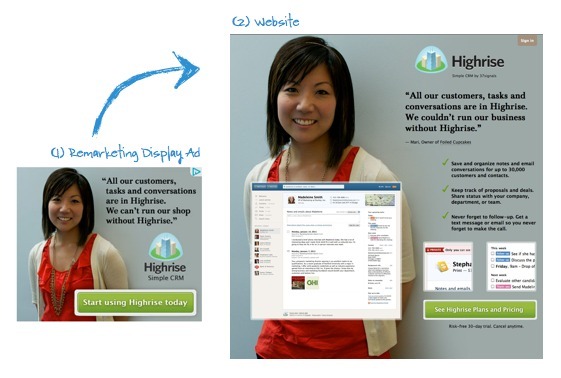 Same girl, same design, same call to action look, same copy. Great stuff. Ad copy (or email copy, or copy of whatever promotional channel you use) needs to match the landing page copy. The closer, the better. Verbatim would be best. While your landing page can fit much more content than a display ad, make the ad message the central piece of the landing page message. Ad design (or email design, etc) needs to match landing page design. That’s it! If you follow these three steps, you’re rocking. Yes, that means you should have a tailored landing page for each ad. No, you don’t need to have 1000 different landing pages that you manually created – you can use dynamic copy. A simple example would be displaying different content for each of your query strings [query string – the stuff in a URL that starts after the question mark (?)] : Ad #1 takes you to somesite.com/?ad=1 and ad #2 takes you to somesite.com/?ad=2. Any 6th grader can write a script that would serve different content based on the query string. Ask your developer, (s)he knows how. No excuses. While people are browsing your site, they’re having a silent conversation in their mind. They’re asking themselves ‘where is X?’ or ‘how do I solve my problem Y?’. In most cases, people are looking for a specific wording. 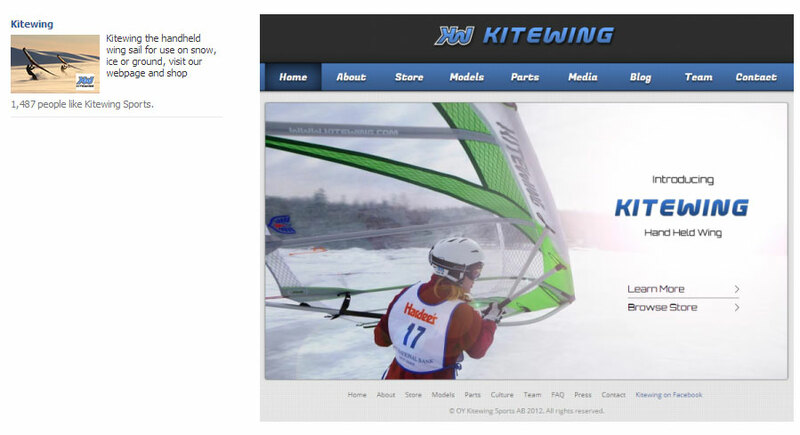 Trigger/Key words are the words and phrases that trigger a user into clicking and visiting your landing page. So when the user types “invoicing app” into Google search, that’s the trigger word in their mind. That’s what you should use in your ad copy AND on your landing page copy. Trigger words are powerful. Yes I clicked on some ads and wasted somebody’s precious ad budget. But I will compensate it with a lesson. I googled “business”, and saw the ad on the left. Clicked on the ad, and the landing page on the left appeared. “Start your own business”, the ad said. 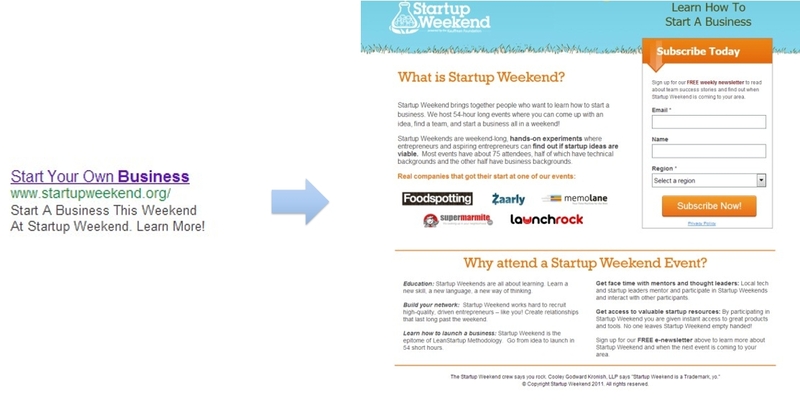 But the landing page says “What is Startup Weekend?” Total disconnect. I wanted to read about starting a business! I guess I’m in the wrong place. I might finally see the text on the top right, or read the full copy (probably won’t), but the scent could be much stronger here. Verdict: the scent is weak. The key message in the ad was “Need US Company?” and “US Company Online in 48 hours”. The headline on the page is “US Incorporation packages for Non-US residents / citizens”, and it immediately offers 5 packages to choose from. What they should have done is to repeat the ad copy in the headline, perhaps add a longer lead, and then lead us to some options. 5 is overkill, 3 could work , but since the product is complicated (and probably not cheap), collecting emails would be a better idea than asking someone to read more. I guess you’re starting to see the trend here. Ad copy says “Lowest taxation in EU” – but the landing page talks about tax optimization and Bulgaria. Did not expect to see this. It takes a while to understand how its connected. Ultimately, it depends on what the searcher was looking for. Verdict: the scent is average. I used to live and work in Dubai (2005-2007). That helped me figure this out quicker than some, but it’s a pretty good “never do this” example. “Job vacandies Dubai UAE”, says the ad. What does the website say? Nothing! Absolutely nothing. The only scent about Dubai are the 2 ads, and the 4 job listings below which mention AED – the local currency. If you haven’t been there, you wouldn’t make that connection. And it’s not a proper landing page. And the css is funky. Verdict: no scent. They’re wasting their money. These guys direct traffic to their home page, dios mio. Even gold bars can’t buy brains. 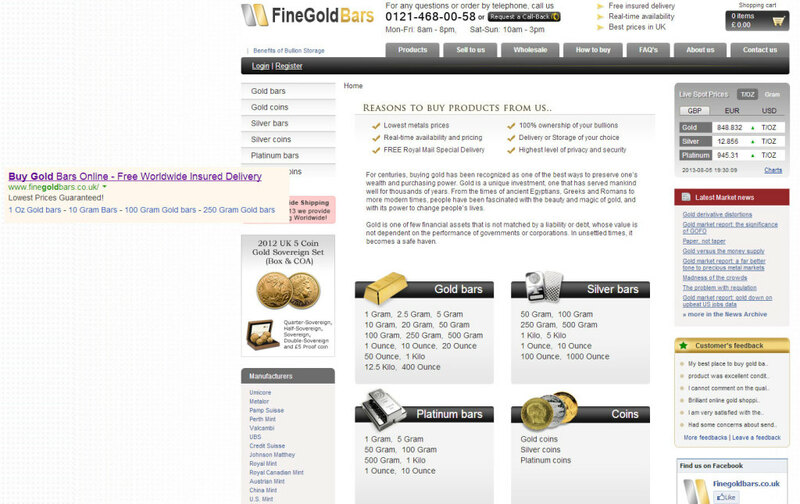 The ad is about buying gold bars online and “free worldwide insured delivery”. What does the home page say? Not much. No value proposition. No headline. The only hint about the nature of the site is through the logo and the design elements. Crappy job, my friends. This is from a Facebook ad. The only thing that matches here is that it’s the same type of product on the photo, but it’s not the same photo (should be). The page has an automatic slider, too (more loss of scent). Landing page has no copy except for the product name. What about some of these newer, more modern companies? Same damn story. “Invoicing application” vs “fall is love with your accounting software”. They didn’t even say “invoicing application” which is what I searched for and what the ad said. Surely these guys must know what they’re doing since they’ve got me as their client. No such luck. 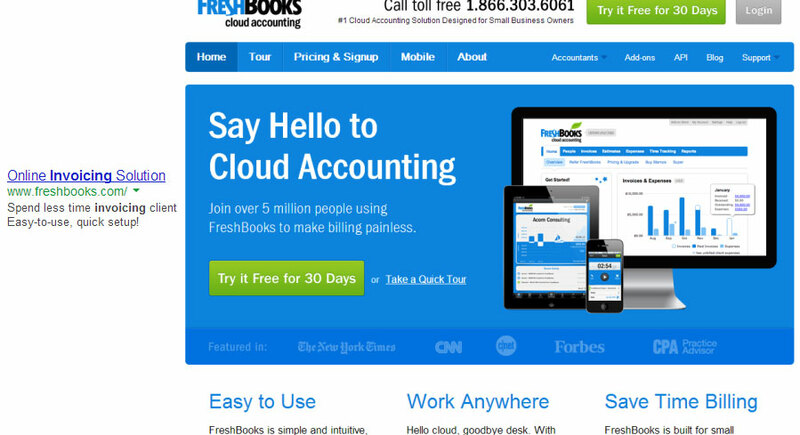 “Online Invoicing Solution” vs “Cloud Accounting”. Yes, there’s “painless billing”, but it’s not the word I had in my mind. Can do better. Branding through packaging – maybe. But through ads and landing pages – not so much. 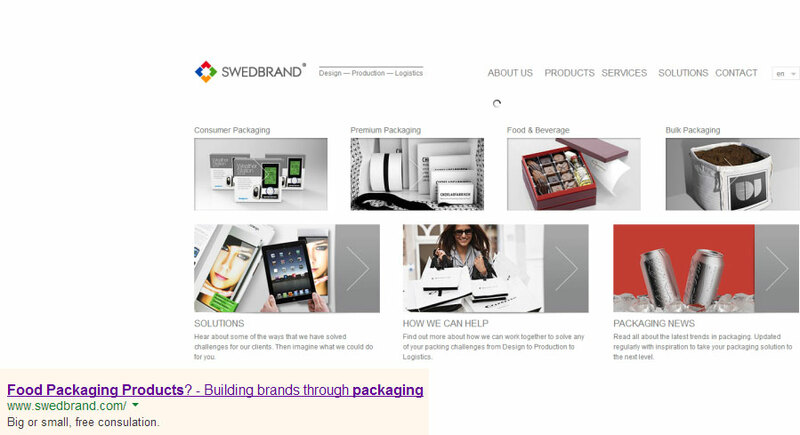 I searched for “food packaging products”, like the ad shows. However, the landing page says nothing about it. Yes, one of the 7 categories is “Food & Beverage”, but that’s not enough. Why the hell is the user landing to a generic page when the search was specific? Whoa, really? Green/orange banner and dark gray / red landing page? Talk about disconnect! 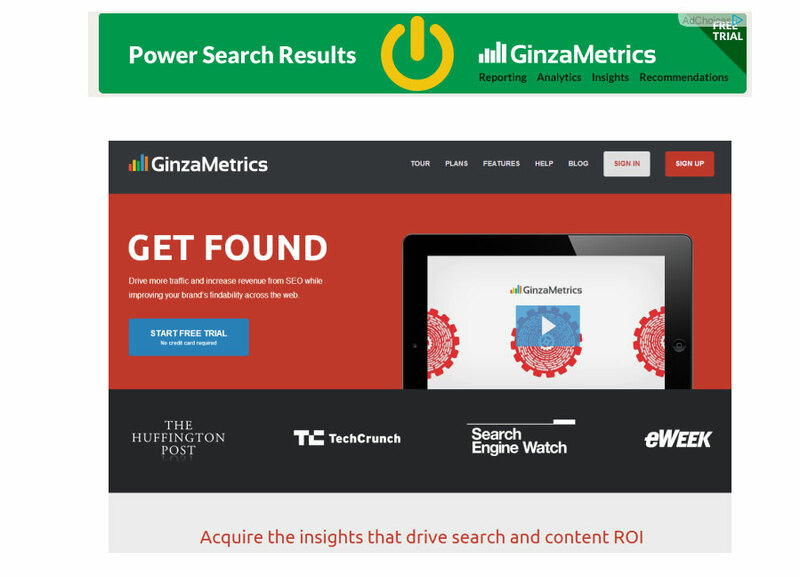 Also: “Power search results” vs “get found”. Scent is important and will help your conversions. Lack of scent creates confusion and hesitation. That’s bad. Still – when you look around the web, so many companies don’t “get it”. Too bad for them. From now on, always make the pre-click message match the post-click message (look and feel too), and watch the conversions grow. Great article as usual. I’ve been studying for the Google Display Advanced and came across this line in Googles help file just after reading your post. Especially the last line. I think your post made a lot of sense, especially the highrise example, do you think Google’s advice is wrong, or are there certain circumstances where you would go against what you advice in this post? Google earns money when people click on ads. Their advice is how to create your ad in a way that gets more clicks. You make more money when your landing page converts better – and scent is part of it. If you’re just getting more clicks, but not so many conversions, you’re losing money (and Google is making money). What I understand there for myself is how important it could be for my ads to incorporate a picture…! I do adwords amongst other things, but without any pictures. You can use display ads (with photos) for any business – from billing to windshield repair to pre-schools. Doesn’t matter. Many thanks, and by “You can”, maybe you mean “You should”…right ? You need to identify what works the best for you, and focus on that. It’s impossible to know in advance how it’ll work for your business, and it mostly depends on the execution. Peep, I love your new splashscreen “Don’t get Peep angry, enter your bloody email”. Another great article. Thanks for emphasizing the mandatory link between the advertisement and the landing page, we all need to hear this often! It is too easy to get caught up in catchy phrases to get clicks…. Great article. New way to think about a concept I think has been developing for a while. Article helped me organize my own thoughts about this in a more concrete manner. Now that is is clear, seems like such basic common sense to me! Thanks! Great Post Peep. This article is really very informative to all especially to freshers like me. Keep sharing such posts regularly. Would you suggest investing in some landing page personalization software to match the ad copy on the landing page to the searchers’ keyword(s)? A few of the text ads > landing pages reviewed (ex. 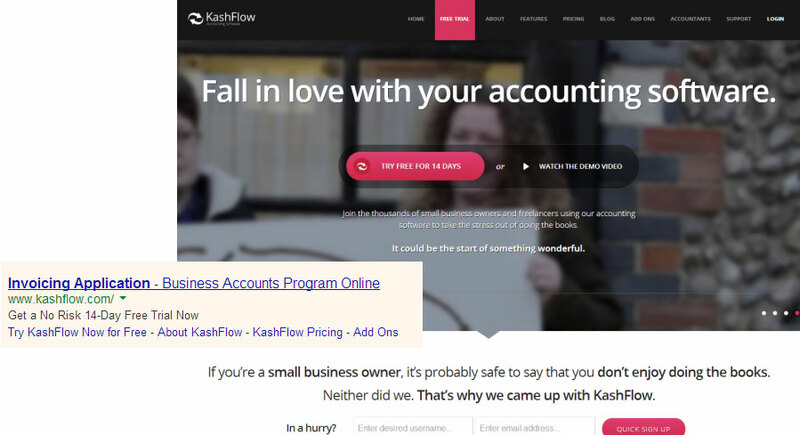 Kashflow) looked like they were using Adwords dynamic keyword insertion, so there was no simple way for those landing pages to match the ad copy outside of using additional software. Or on the flip side, should PPC managers avoid using dynamic keyword insertion unless they can match the landing page copy to the keyword used? I know it’s a case by case basis thing, but what would you suggest for most of your clients to keep the scent fresh? I guess I should elaborate – outside of creating multiple landing pages per keyword trigger, per ad group, per campaign – which could be just as (if not more) cost prohibitive for a SMB as some personalization software. Awesome tip about the trigger keyword. My first rule of thumb when increasing conversion rates is to give a page 1 goal only and remove all other distractions to that goal. That way, the prospect will end-up doing the set goal on that page. Its worked wonders for me so far but I think I’ll give trigger words the same value. It makes TOTAL sense! Great post! Great article. Those are perfect examples of companies totally blowing it, and those are ones that are savvy enough to have online ad campaigns. I’ll tell a search engine or company exactly what I want–and don’t–and feel sometimes like the result comes from the Magic 8 Ball. Dear big data & digital ad companies: give me what I want. That’s your job, and when you do it right we’re all better off.